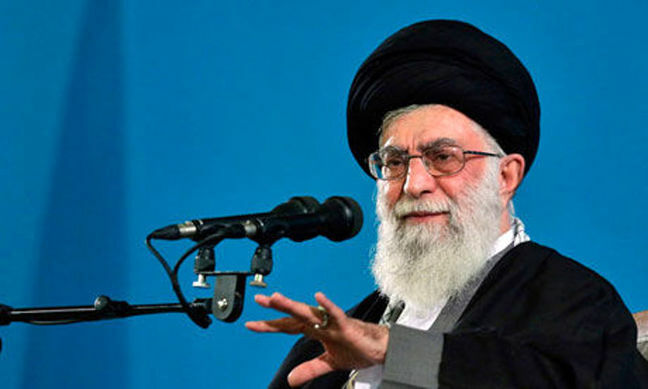 EghtesadOnline: Supreme Leader of the Islamic Revolution Ayatollah Seyyed Ali Khamenei on Saturday called for opening of diplomatic umbrella to the world and avoiding focusing on broadening relations with a limited number of countries. The Supreme Leader made the remarks in a meeting with President Hassan Rouhani and his cabinet ministers in Tehran on Saturday. 'In our diplomatic approach, we should be very vigilant, updated, rapid and wise to stand against enemies as before,' IRNA quoted Ayatollah Khamenei as saying. To attain the goal, the supreme leader advised officials to mind people's economic problems and urged them to spare no effort to this effect. The government should endeavor to change the oil-based and fraud-based economy to a productive economy which is based on people, Ayatollah Khamenei said. All members of the government should be united and work relentlessly and non-stop to meet peoples demands, the Supreme Leader said. The Supreme Leader also advised officials to avoid aristocracy and join public streams in cultural and economic issues and services. Having a precise, written and scientific Roadmap and paying due attention to the country's economic plan through ratification of required laws and showing courage will be vital to this end, the Supreme Leader said. The main criterion for such people active in serving nation, could be defined as having perseverance, pious and revolutionary characteristics, the Supreme Leader advised. Before supreme Leader's remarks, President Hassan Rouhani briefed performance of the 11th government and upcoming programs of the 12th government.